then hover over an icon below the selection. Almost instantly you will see a tooltip with the translation. //* This is a descendant of lazyttrick's http://userscripts.org/scripts/show/36898. 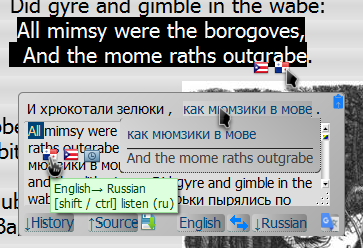 v3.7.2 2015-04-20 * TTS: alt-select text inside tooltip and [shift/ ctrl]-click language icon below.